To answer this question we must first define what is meant by "Prophet". If by "Prophet" we mean someone who speaks for God with authority and accuracy, then it is possible (but not wise) to say there is prophecy today. Such a person simply brings a message from God to people. A preacher does this, an evangelist does this, etc. If by "Prophet" we mean someone that speaks forth NEW Revelation or direct new words from God, that is another story, and we would deny that as a present day ministry. But first, to get an overall perspective on what is prophecy, let us look at each Testament. First we will survey a few OT verses. 1. First up is the coming Messiah of Genesis 3:15 where the Seed of the woman is introduced; such an one would one day come to to crush the serpents head, though He Himself would suffer in His heel. This is therefore a direct prophetic teaching of a coming Messiah. 3. A similar term "seer" (Hebrew hozeh) seems to have emphasized having a vision of/from God. Therefore we see prophecy includes direct revelations like that of a coming Messiah, "visions of God," and "words from God" (1 Sam 9:9). 4. Surprisingly for many perhaps, is that while the aspect of foretelling the future is a strong prophetic feature, it is not the only one. At times, a dual meaning is exhibited. Zechariah 3 is a good example. There a remnant, having returned from Babylon, is given a word to help encourage them to press on to rebuild the temple, while they are told of a special person, a "Branch." Ultimately this Branch is the Messiah who would come 500 years later. One commentator describes in such dual prophecy a "prefilling" and a "fulfilling" aspect. 5. Deuteronomy 18: 18-22 perhaps gives the most thorough Old Testament picture of a true prophet, and in doing so gives pertinent warnings again the false. 6. Last, the Old Testament appears to have had a moral and 'cultural guardian' aspect to prophesying. We see this in Samuel heading up a school of prophets. See 1 Samuel 19:18-24. In summary, the OT prophet spoke for God, guided the nation with correction, gave rebukes & warnings, and visions. They also foretold the future - with a view to Messiah. In the New Testament prophetic ministry continues. For example, Acts 21:4 tells of disciples warning Paul through the Spirit not to go to Jerusalem and why. The Lord Jesus refers to Himself as a prophet in Luke 13:33, 1 Corinthians 14 shows that the NT prophets were speaking the very words of God (before the canon was completed) and brethren were instructed to discern what was said. With regard to interpreted tongues, when comparing 1 Cor. 14:1-5 and Acts 2:17-18 it appears that interpreted tongues were equivalent to prophecy. Thus prophecy and tongues are closely related. If prophecy has passed away, then tongues have as well, which is another point for consideration. Now, therefore, you are no longer strangers and foreigners, but fellow citizens with the saints and members of the household of God, having been built on the foundation of the apostles and prophets, Jesus Christ Himself being the chief cornerstone, in whom the whole building, being fitted together, grows into a holy temple in the Lord.. Here we begin to find the information that will answer the question, Are there Prophets today? The purpose of prophecy is key, and was laid by the ministry of the apostles and prophets, the Lord Jesus being THE Cornerstone. A building is now being erected on that foundation. 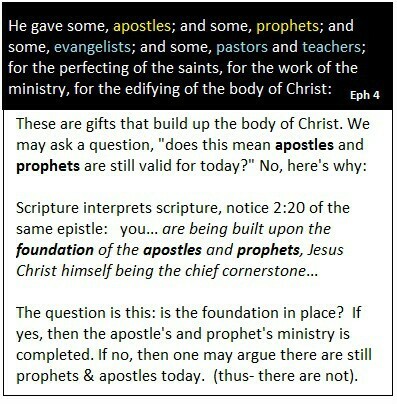 The prophets & apostles had a as their primary work - the laying the foundation. This was completed. In many ways, and in various ways long ago, God having spoken to the Fathers in the prophets, in these last days spoke to us IN SON. We see then, that at the completion of the NT Canon, the emphasis was that God has spoken, now in a SON in contrast to prior times, through prophets. Love never fails, but where there are prophecies, they shall be rendered inoperative....for we know in part and prophesy in part, but when the complete (perfect) thing comes, then that which is in part (literally "the out of part") shall pass away. Prophecies were to pass away/be rendered inoperative. The explanation of this passage when translated "prophecies shall fail" has been misconstrued by some, with the strange argument by some today (continuationist circles) that 1 Cor 13:8 tells us such "fails" mean that some prophecies today will turn out false-some true. This thinking allows for the broad range of wierd & widespread failed prophecies we see today, allowing the false prophet to continue in good standing (sic). This is a frightening view of the matter, and ignores the warnings of a false prophet in Deuteronomy. It also allows the so-called prophet to retreat into errant prophecies and excuse them, which is a horrendous thought. It ceases to be prophecy and appears more like advice or even fortune telling. This concept is a broad problem within charismatic circles. What we mean is this, the word of faith movement, puts much of the emphasis of the ultimate "success" of something spoken- puts it on the one exercising so-called faith- the one wanting answers or being prophesied to. If something fails to come to pass that was advertised as a prophecy, the problem isn't with God who so-called gave the prophecy, but due to the prophetic messenger making a "mistake". Or another excuse is the lack of faith in the prophetic subject. Like dealing with healers, if you don't get healed, the problem was with you, not the faith-healer. This removes all responsibility off the "healer" and the "prophet" and places the problem back on his subject. How many times do the charismatic laity experience or receive incomplete, nebulous or downright false prophecies, before the sham dawns upon them? And when it does, the disillusionment can be extreme and make them into antagonistic skeptics. No wonder the biblical warnings and judgments against false teachers & false prophets is so pronounced. 2 Peter 2:2 is a helpful further proof of the NT emphasis having moved away from prophecy to teaching. What we mean by this is that it shows how teachers were the problem in the NT church, not prophets. Apostles and prophets laid the foundation, and it was completed, Christ is the Cornerstone. A prophet today is not needed to re-lay that foundation. God spoke in times past through prophets, today He speaks IN SON. To emphasize a prophet today is to emphasize a "man" and miss the SON. Prophecies were to be rendered inoperative, and have been. We see a relationship between interpreted tongues and prophecy as well, for two points of cessation rather than one. False Prophets characterized Israel, False Teachers characterize Christendom. The New Testament emphasis is upon the Teacher, not the Prophet. Are there Revelatory Prophets today, in this age? NO. One more thing...this blog has not taken into account that which comes after the end of the present dispensation when the church is taken away to glory. Then shall prophecy re-start, so to speak, in the tribulation period, where God takes up His dealings directly with His chosen nation, Israel, once again. This further emphasizes the point that the present age has an emphasis on teacher not the prophet (to use those two points of contrast). Finally, the test of experience. We have found that in the matter of prophecy as practiced by the modern continuationist, that one of two things takes place. 1. The prophecy fails and an excuse is either generated or the failure is ignored. 2. That which is called "prophetic" is vague in the extreme, with little accountability therefore to the one making the utterance. The great puritan John Owen has been quoted as saying, "If private revelations agree with scripture, they are needless, if they disagree, they are false"
Ultimately, experience isn't the barometer of truth for either side of this question. The enjoyment of Christ and growth in the body is evidenced by sound understanding and exercise of the continuing gifts, rather than those that have ceased. Prophecy, like Apostleship, has ended, in the New Testament context. post-script 1: We are aware of the discussion of 1 Corinthians 13 related to the "completed canon" argument, but do not use that since some of us have the conviction that it is "love" which is that which is "perfect" in the context of 1 Corinthians 13, not necessarily (though a valid study) the completed canon argument. The latter IS perfect of course, but is not what is in view in that text. Love is. Love has come and the coming eternal state will be characterized by love. postscript 2: Does God not speak to His people today? Absolutely. But never to act in contradiction to His word (a widespread problem in the continuationist/charismatic movement), and via his Word and at times by impressions that guide them, rather than direct revelation. God guides, leads, and reveals to His children in His sovereignty. But we would argue this is not as the modern "prophets" or "word of knowledge" people are acting out. We have tested these things and found them lacking, both via scripture and in practice. The Bible is the primary guide of believers and is quite sufficient to determine if an impression is within the construct of God's revealed will in that lovely book. Example of a frequent continuationist error: One might say, "God called me (a woman) to be a preacher/pastor". No He did not, this contradicts His word. Oh how frequently this type thing crops up in the charismatic movement, to the dishonor of God and His word. postscript 3: The charismatic movement as a whole is what we would call at best heterodox. Parts are heretical, small parts have sound men who are orthodox on essential matters. What we are dealing with is a landscape in evangelicalism that is obsessed with tolerance, and a fear of offending. The charismatic movement retains elements of the gospel but is made up of a whole stream of people that do not regard helps outside their tradition (ie...sound, tried & tested teachers of the past are ignored). A great deal of the movement has become "market driven" and churches adjust to the culture and become what it needs/wants the church to be. They aren't subject to a biblical standard, but rather to the whims of experience and so called leadings (!?) of the Holy Spirit. It is a growing global error with great influence and is deadly. postscript 4: BELOW are actual examples of the generalities and non specificity of "prophetic utterances" with regard to their "content". Notice they include positive confession (third one) and have little semblance of biblical prophesying. This came from "Generals International" a group that sees themselves as being a modern group of apostolic prophetic elders. Notice the emphasis is upon ailments common to many people; debts, poverty, legal. They often include such things as wayward children and health. These "problem areas" combined affect a very large percentage of the population, hard to miss out on a general "prophecy" using such starting points. Example 1 God will use the coming shakings, even from internal attacks, to wake up people to their need for God. This will come in waves, subside, and come again. Example 2 We received an admonition. . .to be very intentional to share with great love what we are receiving from the Lord as we prophesy in the coming season of shaking and whirlwinds. Example 3 I will prosper and pay off all debts. In my turnaround year, I will receive the God-given plan to get out of debt. I will go to new levels in my faith. Poverty will not have any hold on me. All court cases against me and problems related to business will turn around.